Last week, this journal published a piece on Francois Hollande’s election as the new French president and its negative implications for President Barack Obama. Outgoing president Nicolas Sarkozy, the article claims, was done in by France’s poor economic performance. “[T]he truth is that this election came down to the most important factor in every voter’s mind: the economy.” Ignore for a moment the absurdity of claiming that every single voter believed the economy was the election’s most important issue. Merely asserting that the most important factor in most voters’ minds was the economy would still represent a gross misunderstanding of French politics. The piece goes on to assert that Sarkozy lost in spite of raising France’s retirement age and his close association with German chancellor Angela Merkel. This was not the case—in fact, both of these factors helped cause Sarkozy’s loss. As the author himself admits, Sarkozy’s attempted increase of the retirement age from 60 to 62 caused “protests that made those against Obamacare seem mild.” Is it far-fetched to believe that this move could have soured the public against Sarkozy? Furthermore, association with Chancellor Merkel cannot have helped the incumbent. Sarkozy was compliant in Merkel’s crusade to impose stringent austerity measures for the Eurozone. These measures, widely accepted as obstacles to France’s economic growth, became part of the stigma surrounding Sarkozy’s presidency. Not only did Sarkozy support growth-killing measures, but in doing so he was subjugated by Germany’s ruler (do not forget the long-held animosity between the two nations). 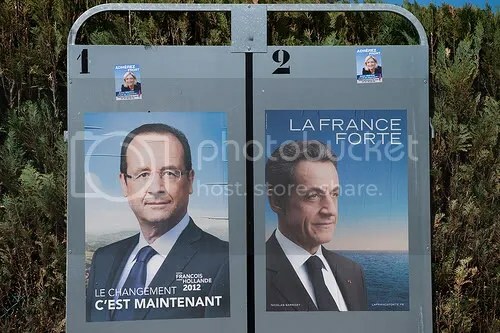 Sarkozy’s image was also hurt by his long list of public gaffes. He held lavish dinners, married a supermodel soon after a divorce and, more recently, was seen removing a $70,000 watch when shaking hands with supporters, clearly worried it would be stolen. Sarkozy has also left French troops in Afghanistan longer than many French citizens believe is necessary; Hollande’s promise to remove all troops by the end of 2012 was effective in highlighting Sarkozy’s military weakness. In fact, Sarkozy’s insistence on keeping French troops in a primarily American conflict made him seem like an American puppet. Sarkozy, then, could be seen as a carousing, elitist marionette of Germany and America with bad policies. This cannot have endeared him to French voters. Consequently, the article’s claim that “This election was a referendum on Sarkozy’s economic performance” seems to be an exaggeration, if not false altogether. While one cannot ignore the fact the French economy is struggling and unemployment has been hovering near 10 percent, saying that the economy was the only issue that determined the election is an oversimplification that willfully ignores the intricacies and nuances of a political campaign. Not content to stop here, the article goes on to assert that Sarkozy’s loss is a death knell of sorts for Obama’s chances at reelection. Given that both Sarkozy and Obama have presided over weak economies, the article implies, their respective reelections are intimately linked. Again, this is an oversimplification. The two men are on opposite ends of their countries’ respective political spectrums. Sarkozy is abrasive and rash; Obama is calm and collected. Sarkozy’s opponent was a Socialist who ran on a populist platform; Obama’s opponent is a Republican who advocates extreme deregulation—the differences go on and on. Disregarding all of these individuals’ personal characteristics to merely define them by their nations’ economic performances is not only an affront on both men, but on truth itself.